I don’t have much to say about today’s meals. We are running out of vegetables, so I roasted what we had: small potatoes and sweet potatoes with some olive oil and sea salt for lunch. It was really tasty though! 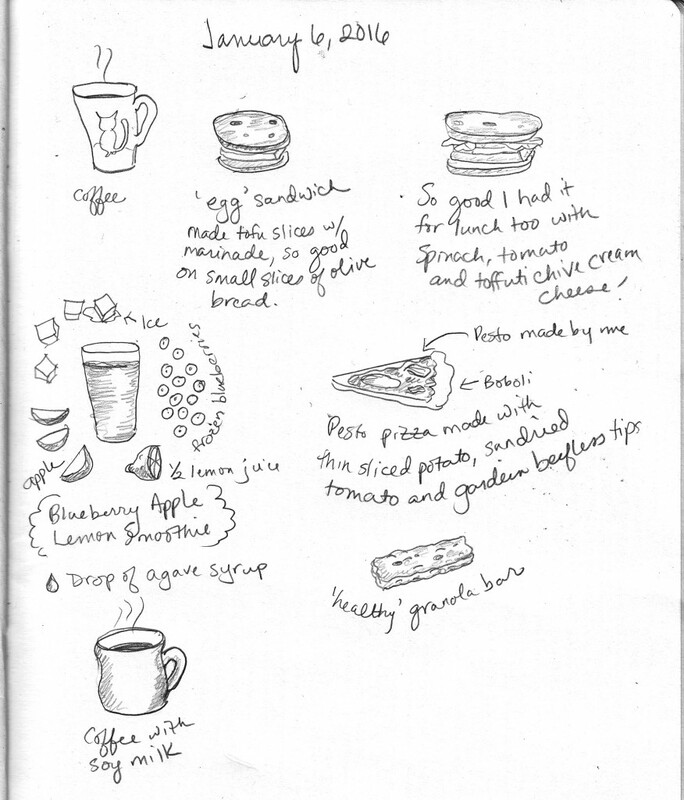 That rounded bread is from Grand Central bakery– Como bread… and I could live on that alone. I take great pride in scrounging together meals when I have basically nothing in the fridge. It is like a “Chopped” cooking challenge when they get those mystery boxes with odd ingredients. I almost had enough coconut milk to make another curry but not quite. Kids had noodles with daiya cheese and mixed veg, along with some Quorn “chicken” nuggets for protein. The Quorn is fungi, not soy-based, and the cheese is potato-based. Sadly Quorn uses egg whites and milk, so they aren’t vegan. On a completely different note, we have been putting stuff from our garage outside our house with a free sign and it gets carted away within an hour usually. It is amazing. Dusty old BBQ grill with bag of charcoal that got wet- gone. Tall cheap IKEA bookcase- gone. Top of an IKEA chair that could possibly be returned, but that would mean having to go to IKEA- gone! Definitely beats hauling it somewhere or haggling over $10 with some stranger from Craigslist who conveniently forgot that you said CASH ONLY. If you enjoy this veg blog, I would love to have you join the @eatlessmeat4all Facebook page! 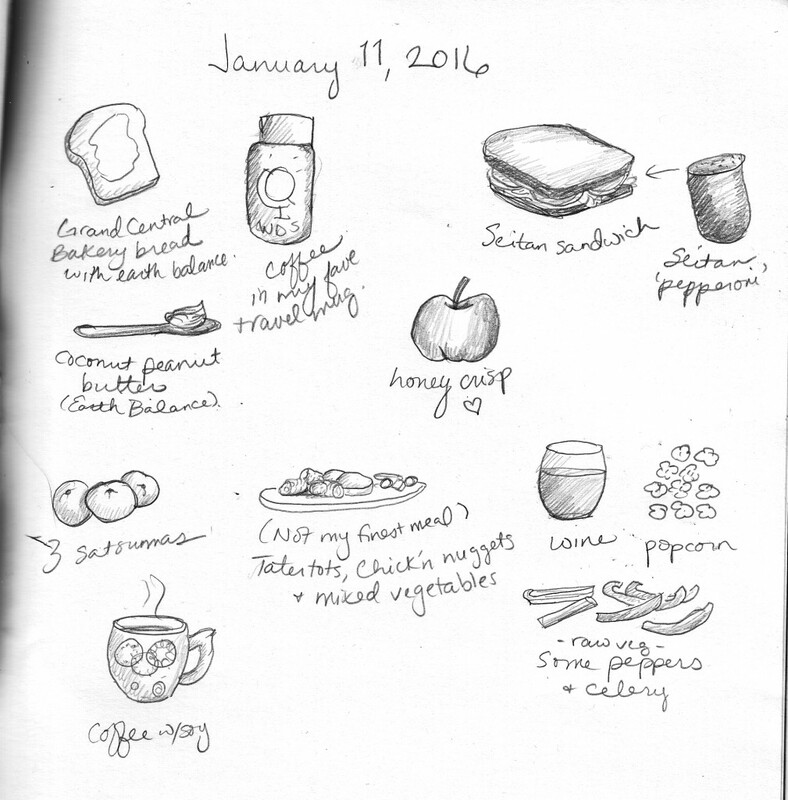 Day two of the food drawings, and nothing makes you more aware of what you are going to eat than knowing you have to draw it. 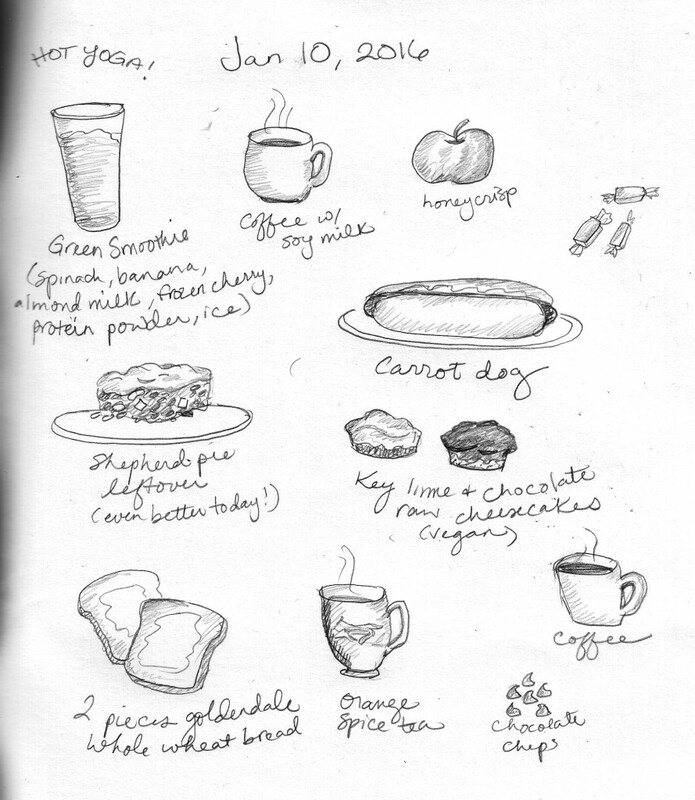 To see it visually represented has impact, and I am working on a way to share the sketches if others want to make their own visual food diary. 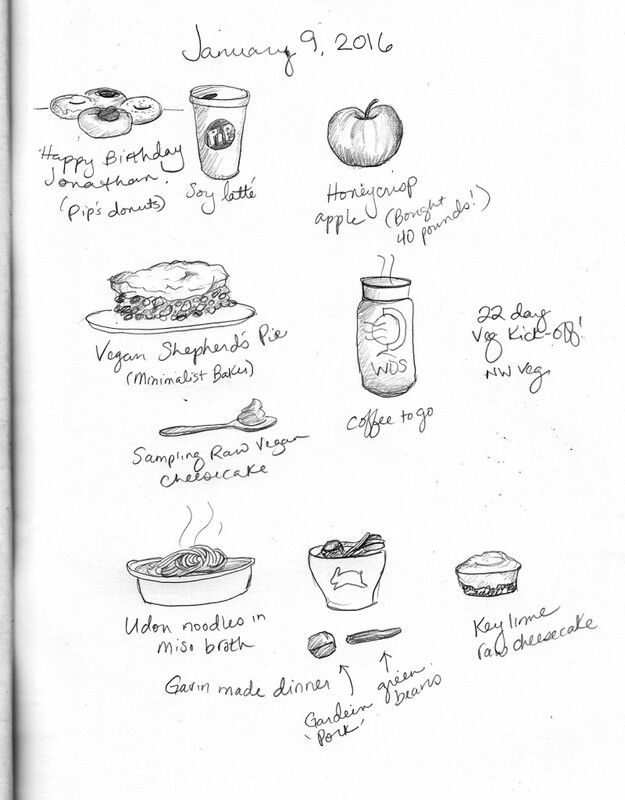 I ate a lot today, and much of it was not that easy to draw- rice, quinoa, I will need to work on that! Also a lot of fruit today. My favorite is “apple” bananas. Not sure about their technical name, but I ate so many in Hawaii and love them. Found them at our local Asian grocery… last time we bought tiny bananas there we had a terrible fruit fly infestation! Hoping these won’t have that issue. I have posted my egg recipe before. Other than that, I didn’t use any recipes today. For lunch, a simple bowl with things I had in the fridge: rice from last night, beans, spinach, salsa and roasted corn. So good! For dinner, we had tacos, which was similar to having a bowl but served in a shell without rice. I added avocado for the kids, and a friend brought us delicious quinoa with vegetables. Quinoa is a seed, not a grain, and very healthy. 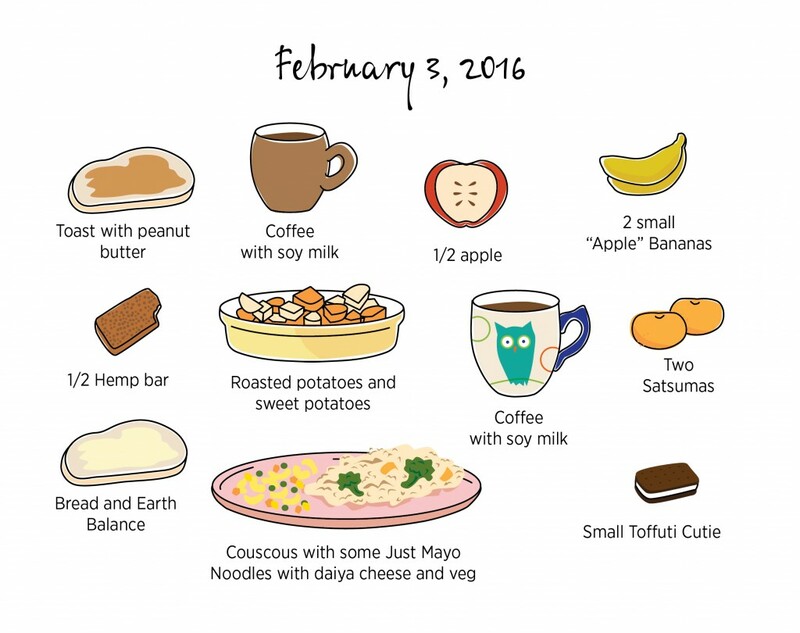 Today someone commented on the amount of soy we eat (mostly me). I’m going to try to keep that more balanced. 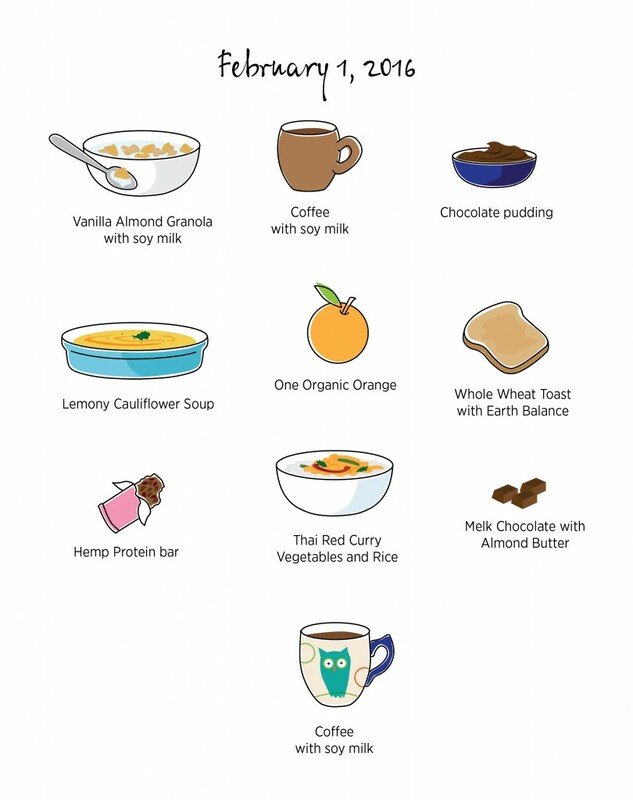 I can use rice milk in cereal for example. Almond milk is good, but we don’t buy it often since it is an extremely water-intensive product. One other note, we have pastel-colored Fiesta ware which is why many of the mugs/plates/bowls look the way they do. Not great for photographing food! Although I enjoy the process of sketching, I am trying this new style. We have plans to expand the food idea so others can use it too. Not only do I like to keep track of what I eat, it gives people unfamiliar with a plant-based diet an idea of what we eat. Also, I am doing a lot more illustration and art lately so this fits in well. Today I got out the paints and will be painting all my canvases (and in some cases re-painting). For lunch today I had yesterday night’s soup, Lemony Cauliflower Carrot soup. It was not as good as I hoped (may be done with NY Times recipes), which was disappointing since I spent $7 on miso paste for this! Oh well, I will make use of it. It won’t be making it into the regular rotation, and Miss Picky wouldn’t eat it. Last night we had it with Roasted Portobello mushroom sandwiches, which were very good. 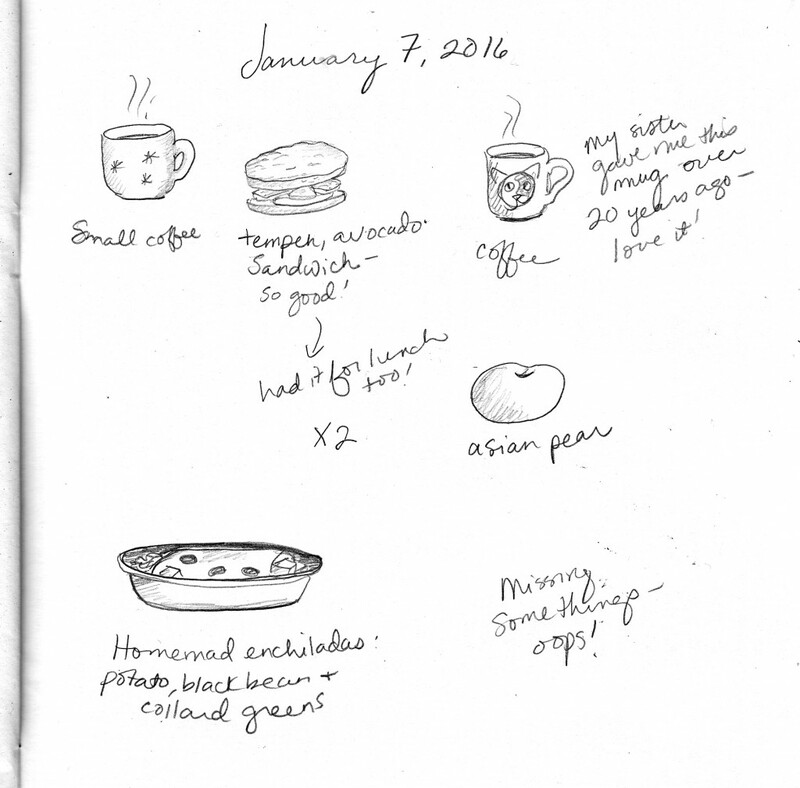 For an after-breakfast snack I had some of the avocado pudding. I liked this recipe okay, but didn’t have enough peanut butter to make that flavor come through. Next time I am going to try a recipe without banana. Everyone loved it except Ms. Picky who could detect the banana with her sensitive palette. The only thing I actually made today was the Thai Red Curry with vegetables for dinner. 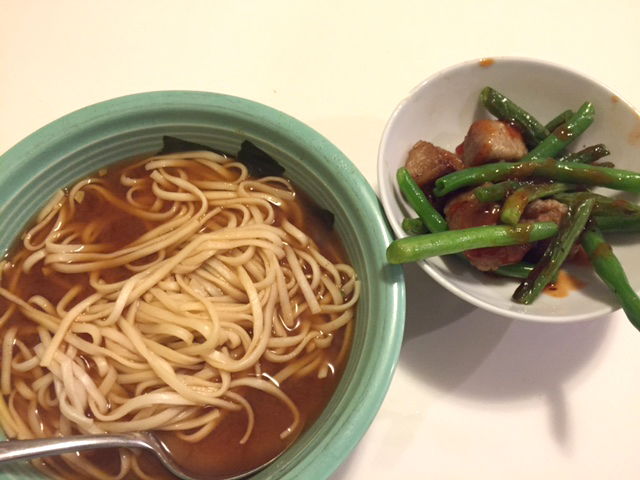 I had the curry paste on hand, and used some green beans instead of yellow bell pepper. Everyone loved this, and I will make this one again for sure. Lastly, some snack bars and chocolate samples we got from the Veg Fest Challenge. And, tonight I wasn’t sure whether I wanted coffee or wine, strangely I can usually go either way. I made my own version an egg sandwich based on an egg benedict recipe from Isa Chandra Moskowitz’ Vegan Brunch cookbook. 1. Combine all the marinade ingredients in a large mixing bowl. Gently press some of the water out of the tofu. Lay the tofu on its narrow side and slice into three pieces lengthwise. So basically you will have three slices that are large, flat rectangles. 3. Preheat a cast-iron pan over medium heat, add a thin layer of olive oil (or margarine) and cook on each side till nicely browned, about 15 minutes. For dinner, I made a whole roasted cauliflower and used this recipe. It smelled divine. I just didn’t care for the almond sauce which turned out way too garlicky. I might just roast a cauliflower another time, or try a different recipe. Every once in a while I make seitan. My husband likes the taste, and it sounds vaguely demonic. My favorite recipe is this one that is baked and tastes like a pepperoni log. So easy to make and packed with protein from vital wheat gluten and B12 from nutritional yeast. It is especially good in a sandwich with all the fixings! I finished off the last of the Earth Balance Coconut Peanut Butter. It is pretty delicious, but I want to research the palm oil in it. I really try to avoid products with palm oil as it is present in so many products and is a major cause of deforestation. Earth Balance is a leader in having higher standards for responsible, sustainable palm oil. I hope so, because I would hate to give up their delicious butter spread! Saturday was a big cooking day. I made vegan Shepherd’s pie and my first attempt at raw cheesecake for my husband’s birthday. It was also the kick off day of NW Veg’s 22 day veg challenge! I am excited to be a mentor in the program and participate in the many events. Hopefully, it will help me keep the energy and creativity I have been having around trying new recipes too so I can share them! I really enjoyed Grant Butler’s talk. 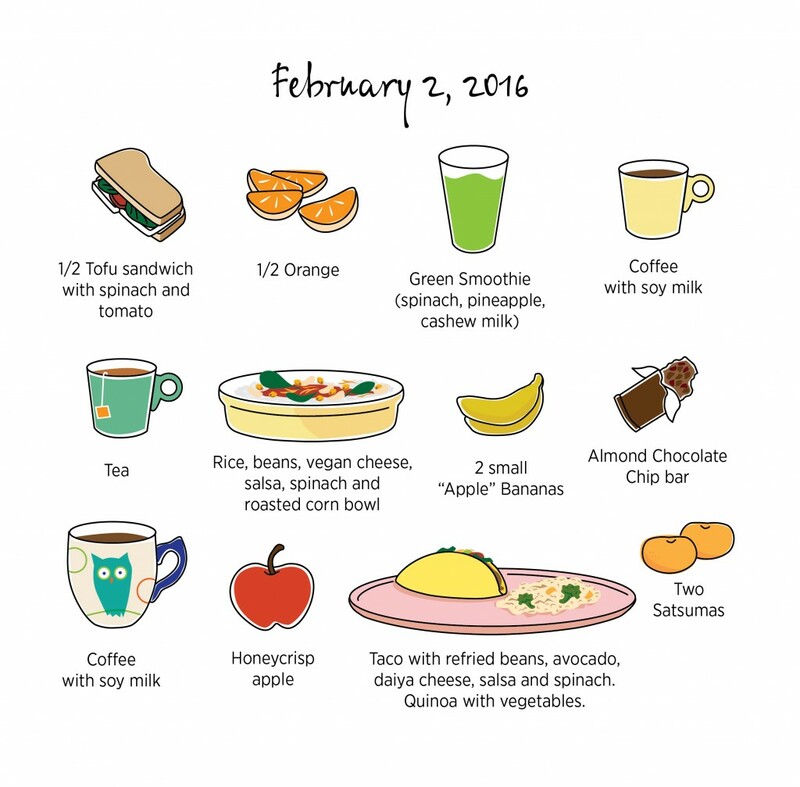 It is always interesting to hear how other people decided to transition their diet. I will write a post about his talk separately, and talk about the challenge. I’m loving Minimalist Baker’s website: simple, delicious recipes that require 10 ingredients or less, one bowl, or 30 minutes or less to prepare. The author, Dana is based in Portland, Oregon and focuses on vegan and gluten-free recipes. Her Shepherd’s Pie passed my picky eater’s test. It even has onions in it which were not remarked upon. We’ll be making this simple and delicious meal again! For the dessert, I decided to try her Raw Vegan cheesecakes that come in individual servings as the base. I wanted to try two flavors: lime and chocolate and looked at some of her other raw recipes to find out how to adapt the main recipe. This was incredible, and quite easy. Cashew-based filling, and no tricky ingredients. I had looked at one that needed Cacao (not cocoa), dessicated coconut (? ), and groats (?) but rejected it since those aren’t available at our local non-fancy store. It did not pass my picky eater’s test (she didn’t like the walnut/date crust), but that was okay because MORE FOR US! It built up my confidence to try another raw dessert soon. We bought 40 pounds of honeycrisp apples. 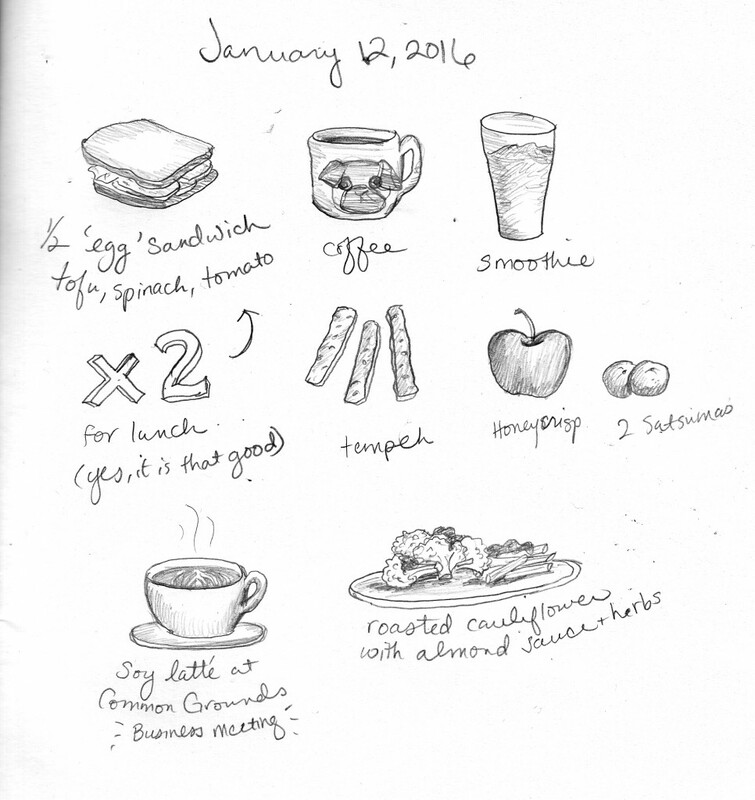 We eat several a day, they are so good, expect to see a lot of apple sketches. My son made his dad’s birthday dinner. They had gone to Food Front Co-op, and bought Gardein’s Sweet and Sour Porkless bites. I have loved all of their plant-based meats. We try to make our meals mostly plant-based, but there is NOTHING wrong with incorporating some veggie meats into your diet. I don’t think this needs to be a controversial issue. No animals harmed. And if you want to try it, I highly recommend these. One of my New Year’s goals is to learn how to take better pictures with my fancy camera. Bear with me, this was a phone pic. Why didn’t I take a picture of the cakes? I guess I’ll need to make them again! They were quite lovely and actually resembled her beautiful photos on her website, you will have to settle for my drawing of them. I may talk a little later about the plant-based meat and cheese I used: Beyond Chicken and Follow Your Heart cheese. 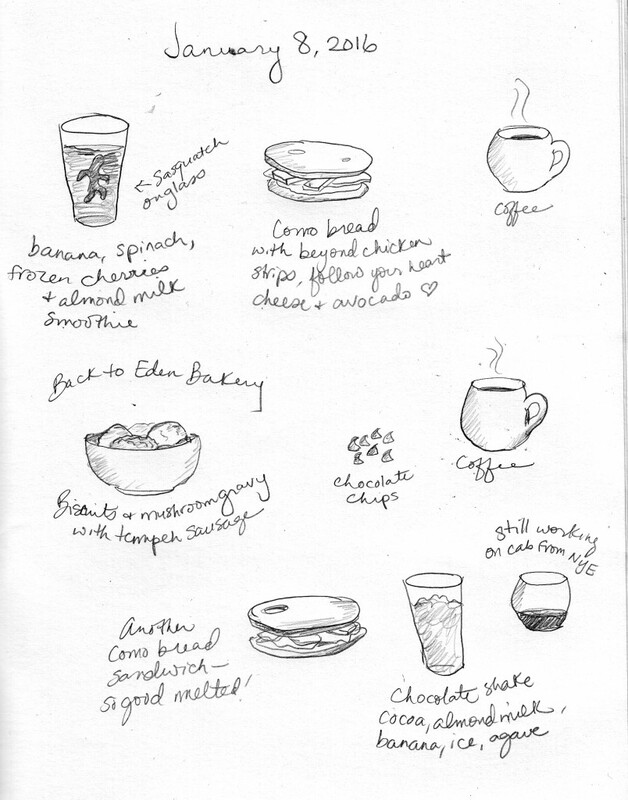 I also went to a local vegan bakery Back to Eden, that I will have to try out again and add to my list. I’ve noticed that I am feeling much more comfortable now experimenting with recipes. Yesterday was one of those scraping-the-barrel days, where I used whatever was in the fridge and made substitutions freely. For breakfast I made an “egg” sandwich loosely based on a Benedict recipe. Marinated tofu slices with vinegar, soy sauce and olive oil. With some salt, on a sandwich with a little tofutti cream cheese it tasted divine. In fact, I chose to eat a second one for lunch. The olive bread was a good addition. For dinner I planned to make a Boboli pizza, but didn’t want to use tomato sauce. Instead I created my own pesto using spinach leaves, garlic, a little lemon, olive oil and walnuts. In the middle of making the pesto, I discovered I only had about 6 nuts. I found some hemp seeds and put those in. I then discovered I had nothing for toppings! I scrounged around and sliced potato very thinly, used some sun-dried jar tomatoes and fried up some beefless strips. It turned out really tasty, almost like a gourmet Pizzacato pizza. A new smoothie recipe using apple, blueberries and lemon sounded particularly good. It made enough for the whole family, not one person as the recipe indicates. Nice break from the banana/spinach/almond milk smoothies I usually make. Yesterday the kids scored an extra snow day! Two more vacation days for winter break (besides the three we took for Hawaii before that). I didn’t eat much today since with hot yoga I really need an empty stomach. It looks like I forgot to label my lunch- leftover minestrone soup and another slice of delicious Grand Central Bakery multi-grain bread. 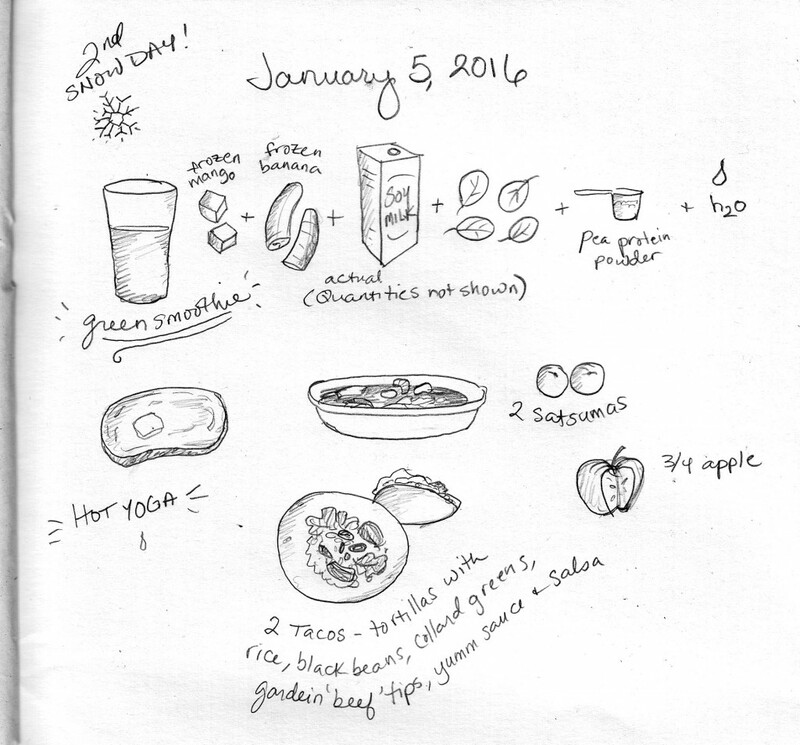 Green smoothies aren’t that exciting to illustrate so I broke down what goes into it this time. For our Taco Tuesday, I tries a new plant meat- Gardein beef tips. They worked great in the tacos, as would “beef” crumbles.